The upcoming 2017 – 2018 basketball season will no doubt be jam packed with both triumph and heartbreak for NBA and college hoop fans alike. Basketball only trails football when it comes to the amount of bets wagered throughout their respective seasons, but with the amount of games being played, bettors have many more chances to gather information and fine tune their picks. Do your homework now and get your accounts set up with the most reputable online sportsbooks before the action starts. Bitcoin basketball, just like Bitcoin football, is only a term used by those betting on basketball who made their deposits to the site with Bitcoin. It’s the regular basketball game that everyone has grown to love and consists of both the NBA and college teams. And just like the other Bitcoin sports mentioned, all the wagers are made in U.S. dollars. Once Bitcoin has been deposited onto the site of choice, the funds are converted into cash / U.S. dollars for the player to use as he or she feels. So now you know that whether you come across basketball or Bitcoin basketball throughout the rest of this article, that I’m referring to the same thing. Whether you’re a fan of the Pro league or more of a college hoops fanatic, you’ll be able to bet on all your favorite teams and enjoy all the action from the comfort of your own home, or on the go, with the following online sites. These sportsbooks have been vetted based on Reputation, Reliability, and being Bitcoin friendly to those looking to make deposits with Bitcoin. Just like football, there’s no shortage of bets available to be made in basketball. And with the shear amount of games that both the college and pro league play, bettors have lots of betting options over a long period of time as well. Money Line: With money line bets, a bettor chooses a team to win outright over the opposing team. But because one team is always favored over the other, a different price must be paid to make it a little more fair. For example, in college hoops, Kentucky is favored over Miami. You might see the betting line say Kentucky – 140, which means that you have to bet $140 to win $100. On the flip side, the money line for Miami might be + 120. This means for $100 bet you can win $120 because they’re the underdog. Without this price difference, bettors would just bet the favorite in every game and win consistently over the long run. This type of bet is best for those who don’t like betting with point spreads and just want to pick a team to win straight up. Point Spread: This type of bet is the most common wager made on basketball. Just like in football, this bet is based off on one team beating the other by a set amount of points. For example, the spread for the Lakers vs Celtics game might read like this; Lakers +4.5 and Celtics – 4.5. This means that if you bet on the Celtics ( favored by 4.5 points ), they would need to win by more than 5 points for you to be a winner and get paid. Conversely, if you like the Lakers ( 4.5 point underdog ), you would win if they either won the game outright or lost by 4 points or less. This type of bet is a great opportunity to exploit the point spreads that you think are way off. So in the above example, if you agree that the Celtics are a better team, but don’t think that they are a 5 point better team, you would bet the Lakers and get the 4.5 point cushion. Over / Unders: This type of bet is pretty simple and straight forward. The bookmakers will set a specific total of points that 2 teams combined score will be, and this will be the line. You can either bet that to combined total of points will be more ( over ) or less ( under ) than the total set by the bookmakers. For example, the line for the Miami vs Detroit game is set at 190. If you bet the over and the total combined score ends up at 204, you would win, and if ended at 188 you would lose. This would be the same for betting the under. If you bet the under and the total ended up being 165, you would obviously win. Anything over that 190 mark makes you a loser. It’s that simple. Parlay: A parlay is when a bettor makes wagers on more than one game ( or leg ) in a series. Parlays are a minimum of 2 games and up to 12 games. The bigger the parlay, the bigger the win, but the bettor must win every one of his legs to reap the rewards of a parlay. For example, if you’re betting on a 5 team parlay, all 5 teams must win for you to win. Even 1 loss out of the 5 will cause you to lose the entire bet. Parlays are attractive because for 1 single bet, you can potentially win a lot more money if you’re correct, more so than winning all 5 games outright. Of course there’s a bigger payoff, but that’s only because there’s a bigger risk of losing. Prop Bets: Also known as “proposition” bets and sometimes called “sucker bets”. These bets, just like in other sports are more for entertainment value and involve in-game occurrences. These are usually 1 time bets like which team will get to 10 first, or player x will have 15 rebounds, etc… . These, just like most prop bets at table games in casinos, should be avoided if consistent profit is your goal. Whether you’re placing bets at your local sportsbook facility or dabbling in Bitcoin basketball at your favorite online site, you should probably do a little homework on the games you’ll be wagering on before risking large sums of your hard earned pay. Look for ” soft lines “: Basically you want to see if any of the lines set by the bookmakers look a little too far off. If you see a line or spread that is giving too much credit to one side, you should bet the opposite way and exploit the mistake. Know the Stats: Educate yourself with how well teams or players do a specific thing well. For example, A great rebounding team will probably fair better than a team with lackluster rebounding stats. Rate the team as a whole: Basketball is a team sport! Even though there’s some players that carry the weight of the team on their shoulders, they cannot win the game by themselves. Even though basketball holds second place behind football in gambling action during the regular season, this all changes during March Madness. Each year in march, the NCAA basketball tournament creates more buzz and has more money wagered on it than any other major sporting event besides the Super Bowl. Large sums of money are just waiting to be won by millions of fans who think they have it figured out. With the knowledge you now have, it could be you! 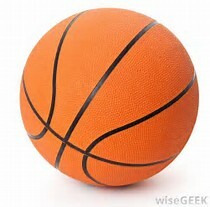 Basketball is one of the most popular sports on the planet. Now that you’ve taken the time to familiarize yourself with the fundamentals of betting on basketball, you should get out there and get some skin in the game. We’ve outlined the basics of what kinds of bets you can make, and the ones to stay away from. We’ve even reviewed the Top 3 Online Bitcoin Sportsbooks that are the best places for you to start turning all your basketball knowledge into extra income. Sign up for an account in minutes and start shooting your own 3 pointers!